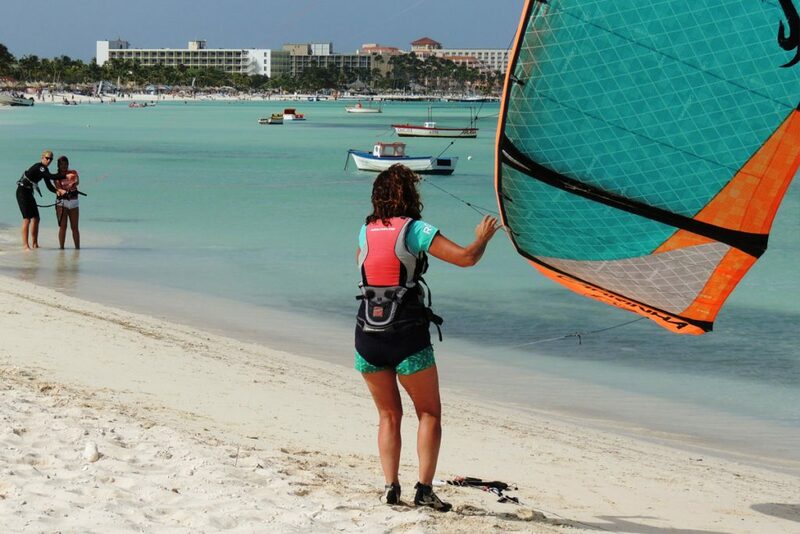 With constant trade winds, flat and shallow turquoise waters, Aruba has become a world renowned kite destination for beginners and pros alike. Are you ready to take on this exhilarating challenge? Focused on delivering the best kitesurfing experience for our guests, we make safety, quality of lessons and equipment a top priority, making us Aruba’s premier kite school. Our internationally qualified instructors will teach on only top of the range, industry-leading equipment, giving our students the best chance to master the sport. Kite Control: For learners with no previous kite experience, we start them on the land with a trainer kite. Here they will learn about wind principles, kite control, safety and set up. Body dragging: It’s time to get wet. Using the kite principles you learnt in your first lesson, you will now use the kite to drag your body through the water in different directions. You’ll learn other core skills such as launching and landing, board recovery, and water safety. Waterstart: It’s kiteboard time. After you understand the principles and are in good control of the kite it’s time to get on the board! This may be trickier than you originally imagined, but it’s all fun and once you’ve got it, there is no better feeling of satisfaction and accomplishment. Get Safe, Get Wet, Get Riding & Get Hooked! The wind window, power zone, and the behavior of the kite in the air and in the water. Flying the kite through the window, relaunching the kite, using the safety release and final release. Learning about safe landing and launching, explain the needed signals for kiteboarding. Body dragging so you can try out the power of the kite that is used to get you on the board in a future lesson. We will give examples of possible situations you might run in too and the solutions to recover from it. We will learn how to retrieve the board when it’s lost by body dragging upwind. We will try the power stroke technique that will create the forward motion you need to ride on your board. Your instructor will discuss and decide with you when you’re ready to try out the board. At this stage being able to have good control over the kite is very important since you will need to be able to control the board and kite at the same time. If the skills learned are a little hard to fully master, it is important to decide that you practice the things you’ve learned in first and second lesson to get full control and prepare you for board riding in lesson 3. This improves your chances of a successful first ride! It might be possible the situation allows for trying the board in lesson 2. If everything is understood and you feel ready it’s time to try out riding! This is where it become tricky because to get riding you need to do multiple actions in a certain order. Detailed instruction on that will be shown and discussed. We will assist you in the water to give you the chance to get the multitasking that is needed to ride under control. At this stage, it’s time to practice all that you have learned. We’ll show you how to ride for longer distances and teach you how to stop when needed in a controlled way. Depending how far along you are at this stage we can add riding upwind to your technique and practice transitions. Throughout the course if there are problems with the skills you learned like your stance, kite control or riding this will be demonstrated to give you a view and example of the wrong and the right way to do certain tasks. This fine tuning of your technique will give better confidence and will get you to an independent riding level within no time. From here on out it’s all about getting time on the water and improving on the things you’ve learned. Additional Lessons or continuing student lessons are 2 hours long and can be booked after a course is had or to continue on from previous experience. In an additional lesson, we can discuss and practice any hang up points you’ve encountered in lessons you’ve had and practice new undiscovered skills together with your instructor. Practice makes perfect and before you know it you get to a more comfortable level to start enjoying the full potential of kiteboarding. If you are a comfortable upwind rider we can start talking about advanced lessons. In these lessons, we will evaluate your level as a rider and discuss a plan to improve or practice a trick or advanced skill you are looking to master. This could be as simple as a standard transition or the basics of jumping to advanced tricks that will suit your skill level.